Evelyn Boylan from Scotstown climbed Mount Errigal in Donegal for the “Sunrise Summit Challenge” on Saturday 26th May 2018. During this challenge she was led and motivated by noted Irish mountain climber Jason Black from Donegal. Now this endurance athlete is currently daring to do what only one other Irishman has ever attempted – to summit the second highest mountain in the world – K2. This is his second attempt to climb it. Jason Black has always loved to test his physical and mental capabilities through endurance activities, so it is only natural that he would now yearn to conquer one of the most brutal, unforgiving mountains in the world. Upon his arrival to K2, Black will be placing a plaque in the mountain’s base camp to honour Gerard (Ger) McDonnell, who was the first Irishman to ever successfully summit K2. McDonnell died 10 years ago this year, on 2 August 2008, along with 10 other mountaineers, after an avalanche struck them on their descent from K2. Black insists that this plaque will be from all of Ireland to show their support for the brave mountaineer who lost his life that day. In 2017 alone, Black has competed in the Race Across Italy (an 800km cycling event with 10,000m of climbing), Ironman Barcelona 70.3, The Beast, summited Mt Elbrus (setting a world record mountaineering speed climb in the process), won and set a new record at the Race Around Ireland Ultra Challenge (he cycled 1,100km in 50hrs and 51mins), and the Race Across Texas (a 1,600km cycling event). Suffice to say, Black is no stranger to gruelling tests of endurance. However, Black will be experiencing a whole new kind of beast in the weeks to come. For decades, K2, standing at a mighty 8,611 metres, has pushed climbers and mountaineers to their limits, mentally, physically and emotionally. Often known as the “savage mountain,” due to its extreme difficulty to ascend, K2 has had only 300 successful summits, but also 77 fatalities. It has the second highest fatality rate of the ‘eight-thousanders’ (the 14 independent mountains in the world that reach more than 8,000 meters above sea-level). After many failed attempts in the nineteenth century, the first expedition to succeed in summiting K2 was led on 31 July 1954 by Italian man Ardito Desio, with climbers Lino Lacedelli and Achille Compagnoni. The first woman to summit K2 was Pole Wanda Rutkiewicz on 23 June 1986. With the advances in modern technology and depending on the success and execution of each day’s climbing plan, expeditions on K2 usually take between six to eight weeks. Black leaves with the McDonnell family’s blessing and Ger’s jumar (a device used for directly ascending a rope). Gertie, McDonnell’s mother, gave Black his climbing jumar as a gift for his K2 climb. “Mountaineer Ger McDonnell will never be forgotten for his heroic and unselfish actions in the mountains – to climb this year with his jumar in my hand, given to me by his mother, Gertie, is both humbling, trusting and empowering,” Black said in a recent Facebook post. 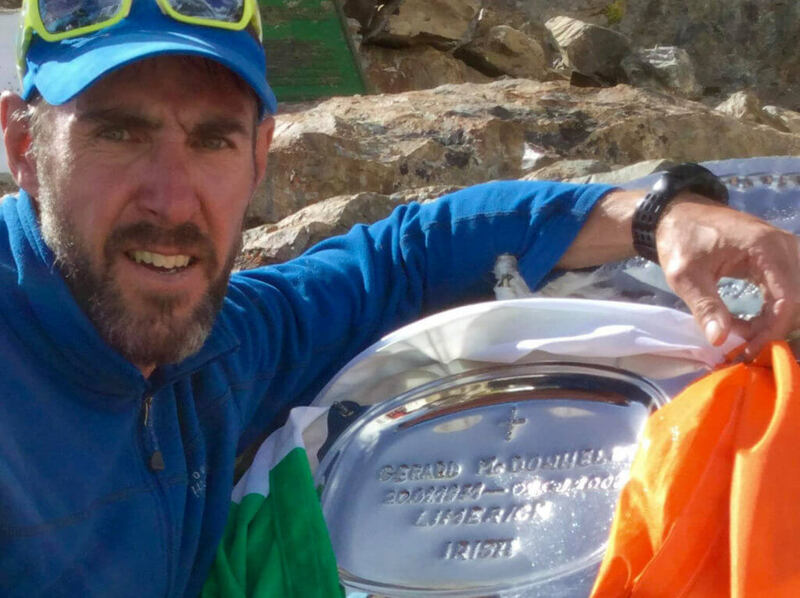 Black hopes to pay homage to McDonnell by becoming the second Irishman to successfully summit this iconic mountain. Ned Run 2018 on Friday 3rd August – come out for a great event!